“On behalf of President Obama, I am pleased to announce that we have reached an agreement that establishes the basis for resuming direct final-status negotiations between the Palestinians and the Israelis,” Kerry told reporters in Amman. Israeli and Palestinian negotiators will soon meet in Washington to work out final details of re-launching peace negotiations. The diplomats expected to meet face to face in Washington are chief Palestinian negotiator Saeb Erekat and Israeli Justice Minister Tzipi Livni, who will be accompanied by Netanyahu’s close aide Isaac Molho. “If everything goes as expected,” the diplomats should meet within a week “or very soon thereafter,” Kerry said. 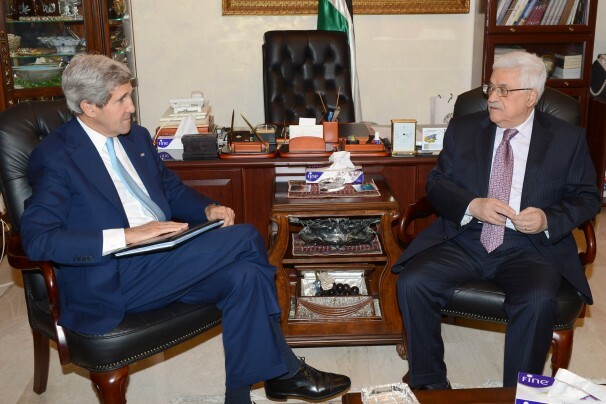 Kerry said nothing about when Netanyahu and Abbas would meet, but he praised both leaders. “Both of them have chosen to make difficult choices here,” Kerry said, without elaboration. Kerry is doing well – he appears to be a sincere and decent man. There is a good chance that he may succeed where all of his predecessors failed, i.e. solving both Arab-Israeli and Iranian-American problems. He may be too old to become the next American president, but if not the next president, perhaps the best president American never had. In the name of the world's Zionist warmongers of the so-called U.S. and its life-term master of Israel, as always, what ever talk it is, whenever it comes to the nation of Palestine, it will never bear any good fruit but instead, just failure after failure since the illegally establishment of the state of Israel back in 1948. The fact is, it is obviously and absolutely nothing and meerly empty rethoric. Yes and pigs will fly. The Zionist land thieves and global plunderers have no intention of giving up an inch of Palestine, Golan Heights or Shebba Farms without being forced to. Only armed resistance will get them out and it is only a question of time as Zionists are on borrowed time as the Arab world in is chaos but will sooner or later get their act together and hence the US pathetic rush to get the "peace talks", but going nowhere. Both US and Zionism are at the cul de sac of history. Both Zionist run police states are kaput. Whether pigs can fly is not at issue! And your pronouncements about the future, near and distant, of which you apparaently know so much and with such confidence and certainty is good for you and for the field of fortune telling. The real question is, Can Israel and the Palestinians reach preliminary agreements for the creation of the state of Palestine? It seems that Israel has accepted to begin the negotiations with the pre-1967 borders as the reference point. That’s a positive development, and might get us somewhere this time, despite your lack of enthusiasm for any peace agreement. Nader Uskowi, I can see that you have so much hope in this new initiative for talk between Palestine and Isreal. You cannot really blame those that have no iota of confidence in the talk. If the past is an important factor in forecasting the future, then it will only take the grace of God for things to materialise this time. So many efforts in such direction have been delibrately aborted just before they seen the light of the day. I personaly do not see the Isrealis as a sincere partner in this talk, they do not seem at all willing to surrender or give up or yeild to the request of the Palestinians as to the pre-1967 border, and the Palestine accepting nothing less. Let us both wait patiently and watch as the talk and event unfold, perhaps we will know who have a better understanding. I pray sincerely that the talk is successful by God's grace. Al-Nakba happened in 1948, and Zionists have slowly but surely encroached on almost 60% of the West Bank of Jordan river, changed the demographics of Jerusalem and built agricultural communes and vineyards on the occupied Golan and stealing water from the Litani and its catchment via Shebba farms. It is one thing to parrot US hypocrisy, due to subservience, but facing reality like in Syria and occupied Palestine is another. Short of a prolonged war of attrition and liberation which will make like impossible for the Zionist occupiers, nothing else will dislodge them. The Hezbollah model of targeting their cities and imposing a cost is the only resistance that will work. The "Arab Spring" will have a lot of long-term unintended and totally negative consequences for both US and Zionists. Stay tuned things are not as rosy as FOX/CNN and other parrot's wishful thinking. I can assure you that Zionists will not survive in the region. It is a matter of time and the clock is ticking. The South African Apartheid idiots had similar delusions of "nukes" and "military" power and today most of them are living In Alberta, BC, Western Australia and New Zealand. 90% of Zionists have dual passports and will be on the first plane when their urban centers are hit (2006 Hezbollah fired only 122mm grads and one million Zionists took flight). It is beyond rational intellectual discourse to see how 5 million imported savages will survive amongst 300 million irate and destabilized Arabs who are in perpetual revolt against their puppet regimes, fed up with unemployment, humiliation, corruption, hunger and soon famine and water shortages if the conflicts continue. Both US and Zionists are on a road to nowhere. The US failing policy of buying corrupt Arab leaders and armies is backfiring bigtime as the US itself is now a bankrupt, socio-economic deadbeat facing internal racial divisions, fiscal melthdown and implosions. Now stick this crystal ball on your pedestal and then some. Indeed mat, it is just more empty rhetoric while no actions are taken. Unless the talk is put into action towards an actual two state plan, it is not believable. Correct. How can there be any "peace" as long as the Zionists do not even consider the right of return for almost 3 million displaced and forcibly Palestinians since the Nakba. There are 4 generations of these destitute and homeless people living in camps all over the region and the world since 1948. There is ZERO chance of any peace as long as the brutal occupation and Zionist arrogance strutting on deadbeat US taxpayers dollar continues. US itself is desperate and imploding and wants some kind of cosmetic "peace deal" to cool the Arab Spring anger. Ain't gonna happen folks, things are only headed south in the Middle East and massive blowback is blowing in the wind. the grandchildren and great-grandchildren of the Palestinians who fled when it became clear that the war that they had chosen to undertake was a disaster are not going to be allowed to "return" to anywhere other than the hopefully soon-to-be-created state of Palestine. it is foolish to pretend that otherwise and dishonest to pretend that all those people in camps throughout the Arab states of the region are there for any reason other than propaganda. Anon 5:06 PM, "propaganda" like your hasbara shilling?